"When we began executing an ambitious transformation of our business, I wanted to bring our new leadership team together to really get to know each other and have the confidence that we would be there for each other going forward. "Having attended at least six of your offsites, I knew you would create an agenda tthat would allow us to openly discuss our business issues and get people engergized to address them. Thank you, I know that we will work together again soon." You have a great group of individuals on your team. Are they working together optimally and getting results? 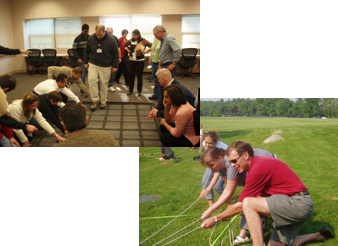 For new teams, new leaders, teams in transition, senior teams or the front line, investing in a two day offsite will bring your organization to a new level of performance. Group sizes can range from six to sixty. Home. Offsite Meetings. Team Building. Culture Building. Leadership Development.